The picture above is of the area of Gunwharf Quays located next to Vernon Gate. Gunwharf Quays opened in 2001 and has got many features to offer including a cinema and a large bowling alley as well as a large number of shops and restaurants with good views along the coast. Gunwharf Quays is situated at the entrance to Portsmouth Harbour between Old Portsmouth and Portsmouth’s Historic Dockyard. The land Gunwharf Quays has been built on is steeped in history. 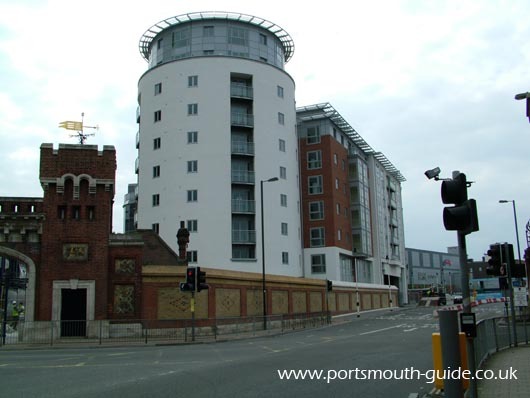 The site has had a varied historical background with the site being used to defend Portsmouth as far back as 1526. The Gunwharf site has been incrementally reclaimed from the sea as time has passed. The site which Gunwharf quays is built upon was the first main ordnance yard for the Royal Navy and was established in the late 17th century. Nelson’s Gate which was built in 1803 has been retained as part of Gunwharf Quays and so too has some of the original boundary wall. In 1891 the Royal Marines vacated their barracks on the site and in 1919 the Naval Ordnance Department too vacated the land, at this point the land was taken over by the Naval Torpedo School and was named HMS Vernon. HMS Vernon was the centre for development and training of the art of torpedoes. HMS Vernon become famous for its clearance diving team and deep diving trials unit. Buster Crabb served at HMS Vernon and was a clearance diver who was working for MI5 when he disappeared after diving on two Russian warships moored in Portsmouth in 1956. After a long life HMS Vernon closed in 1986. The Customs and Excise House was built in 1811 and served as the main customs post for Portsmouth Harbour and is now used as a bar and restaurant. Many famous people have served at HMS Vernon including Prince Charles who commanded HMS Bronnington from here in the 1970's. On 4th June 1997, Portsmouth City Council approved outline planning permission for the Berkeley Group to develop Gunwharf Quays. The residential and commercial side of the development is now open. Work on creating the Gunwharf Quays we have today started in 1998 and was completed in February 2001. Gunwharf Quays occupies a 33 acre site of over 65 shopping outlets, 20 bars and restaurants, a 11 screen cinema, a 26 lane bowling complex, 310 homes, ship births and office space. The development has a 1,450 space car park situated under the development and has recently had the addition of a 130 bedroom hotel. Retail names include those of Paul Smith, Ralph Lauren, French Connection, Gap, Nike, Levi’s and Adidas. A recent additions are an Lindt Shop and an Oakley outlet store. The site also features the Spinnaker Tower, which has views all over Portsmouth and beyond.